Lonesome George. The name says it all. He was the last of his kind, found wandering all alone on the Galápagos Island of Pinta in 1971, lumbering about in his methodical giant-tortoise way. Before then, scientists thought that his subspecies, Chelonoidis nigra abingdonii, was totally extinct. Giant tortoises like Lonesome George were once abundant on Pinta Island, as were other subspecies on other Galápagos islands. So abundant, in fact, that the very name Galápagos-a Spanish word describing the saddle shape of their shells-refers to them. It was bad luck for the tortoises that first the Spaniards and pirates, and then whalers, made it a point to stop over at the islands from the 1500s through the mid-1800s. Lonesome George's compatriots became fewer and fewer as the sailors resupplied their vessels with fresh meat-tortoise meat, to be exact, the ideal food for seafarers on the go. The tortoises were big, providing hundreds of pounds of protein for each day's hunt, and even better, they were easy to catch. Hauling them on board was no simple task, though, if firsthand accounts are to be believed-"returned with five Terrapin and intirely exhoisted [sic]"-but once they were wrestled on deck, the tortoises were easy to store down below.1 Put them in the hold, flip them on their backs, and stack them up. There was no need to worry about spoilage, a huge advantage in the days before refrigeration, because the animals, being tortoises, easily survived for long periods without food or water. The fact that they stayed alive meant their meat stayed fresh and tasty right up to the time they were finally killed for dinner, months after they were captured. So no wonder Lonesome George was, well, lonesome. After he was discovered he, like those before him, was loaded on a ship, but his fate was a bit more benign. He was given a one-way ticket to Santa Cruz Island, where he was installed at the Charles Darwin Research Station, a short walk from the island's main village, Puerto Ayoro. There he calmly watched tens of thousands of tourists come and go each year, for all intents and purposes oblivious to the attractive females of another subspecies of Galapagos giant tortoise with whom the world hoped he would mate and send his genes down the line. It was not to be. As the BBC put it in his obituary, "With no offspring and no known individuals from his subspecies left, Lonesome George became known as the rarest creature in the world. "3 When he died on June 24, 2012, most major newspapers in the world ran the story: the rarest of the rare was no more. Extinction had happened before our eyes. I visited Lonesome George in August 2011, a few months before he breathed his last. At the time he was some years past a hundred years old-no one knows exactly how many. I was on my way back from, of all places, an oil refinery in Ecuador, where I had been helping one of my graduate students, Emily Lindsey, dig giant bones of extinct ground sloths and other long-gone species from tar-soaked sands, so I was no stranger to extinction. But when I saw Lonesome George I wasn't thinking that we were about to lose yet one more marvelous work of nature, something that evolution had taken eons of trial and error to produce. No, I was too overwhelmed by his resemblance to Yoda. Not his body-that looked like a World War II army helmet with four stubby elephantine legs sticking out of the bottom. But he had this weirdly retractable fire-hose looking thing for a neck, which was capped by a wizened, gentle face. What I realized is that all you'd have to do is stick a couple of big ears on the side of his head, morph his facial features a little bit, and there you have it: a dead ringer for the famous Star Wars sage. Now that I think about it, it would work for Dobby in Harry Potter too. Since Lonesome George's passing, the Galápagos Islands also stand as a testament to extinction-and not just of Lonesome George. Of the reptile, amphibian, bird, and mammal species that inhabited the Galápagos when Darwin observed them, about 12 percent are now extinct, and of those remaining, nearly 40 percent are threatened with extinction. Just as Darwin saw that the Galápagos provided a scaled-down, tractable version of how evolution proceeded in the world at large, the islands now provide a mini version of how extinction is proceeding on the global scale. And how it's proceeding is, in a word, fast. The numbers for the world stage are still a little lower than for individual island systems like the Galápagos, in part because islands tend to get hit harder and faster by extinction than continents-species on them can't leave for greener pastures when the going gets tough. Even so, the global percentages of species at risk of disappearing forever are terribly elevated for groups of animals and plants we know about, ranging from about 14 percent of bird species to about 22 percent of mammals, to perhaps 41 percent of amphibians, and to a whopping 64 percent of a type of tropical (and subtropical) plant called cycads. If we average these percentages over all of the species for which scientists have good information, about 30 percent of the world's species are threatened with extinction. First, it's important to pay attention to what we mean by a species. The last time I counted, there were at least twenty-six different, in some cases mutually exclusive, conceptions of what a species actually is, and after a beer or two (sometimes even before), biologists can argue endlessly about which definition is best. But at the heart of it, most of the articles about extinction (in the scientific literature anyway) are using a pretty straightforward definition of what a species is: a group of plants or animals that can pass their genes on to their offspring, which can, in turn, pass their genes down the line to their offspring. If a group of individuals can do that, then they are grouped together as a species, or perhaps a subspecies, and that group is given a name. How to name species can be another hot button among biologists (more beers, more arguments)-but again, for those dealing with extinction issues, naming is most commonly done in accordance with the Linnaean taxonomy you might have learned (and forgotten) in high-school biology. The species itself gets a name, and closely related species are grouped into the same genus, which also has a name. Hence, you (and I) belong to the species sapiens, which belongs to the genus Homo. Rules of nomenclature say the species name technically cannot be used without the genus name-so we are not sapiens, we are Homo sapiens (which can be abbreviated H. sapiens). This binomial nomenclature guards against confusion if, say, a bug taxonomist and a mammal taxonomist (who tend to run in different scientific circles and probably are not reading each other's publications) want to (or inadvertently) assign the same species name to the group of organisms they happen to be excited about at the time. That's ok as long as the genus name is different, because the two are always used together. The plural of "genus" is "genera"-genera are grouped into families, families into orders, orders into classes, classes into phyla, and phyla into kingdoms. In assessing extinction intensities, scientists often talk about the number of species going extinct within a certain genus, family, class, and so on, as I did above for species of amphibians, reptiles, birds, and mammals. Each of those major groups of animals is in fact a "class" in the formal taxonomic sense: Class Amphibia, Class Reptilia, Class Aves, and Class Mammalia. If you do take my suggestion and Google "extinction," as often as not you will find a list of news articles about extinction not of a whole species, but of a subspecies or a population. Take this headline, from the BBC News: "Scottish Wildcat Extinct within Months, Association Says. "6 Dig deeper, and you will find that "Scottish wildcat" refers not to a species in its entirety, but to the wildcats in a part of Scotland. Wildcats as a whole belong to the species Felis silvestris, which is found worldwide and on balance is doing pretty well at staying alive. But there are at least five genetically distinct groups within Felis silvestris-and by "genetically distinct" I mean there are some very, very slight differences in their genome which cause each group to look a little different from the others. These differences arise because dispersal of animals from one region to another has been impeded for a long period of time (at least thousands of years), which means that the animals of, say, southern Europe do not often mate with those of, say, northern Africa. Through time, slight genetic distinctiveness builds up in the different geographic regions, and each of those genetically distinct groups is regarded as a subspecies. Nevertheless, if a wildcat from an African subspecies does happen to mate with a wildcat from a European subspecies, they have no trouble producing fertile offspring, which is why they are considered to remain in the same species. Subspecies can be further broken down into populations, which are groups of interbreeding individuals. The exchange of individuals between populations-which then causes exchange of genes, or gene flow, between populations-runs the gamut from very common to very rare. When gene flow is very rare, the population in question evolves into its own subspecies, and over time may even become its own species. The bottom line is that a given species is usually composed of a bunch of distinct, genetically identifiable populations, with groups of genetically similar populations lumped together and named as a subspecies. In that case, a third identifier, the subspecies label, is added to the genus and species name-and biologists argue about what that should be, too. And that brings us back to the Scottish wildcat. Scottish wildcats, far from being their own species, are simply a group of populations within the species Felis silvestris. Some taxonomists regard that group of populations as so physically distinct from others that they separate them out as their own subspecies, which they named grampia. Thus that group of populations would formally be called Felis silvestris grampia. Other taxonomists regard those Scottish populations, on genetic criteria, as belonging to the widespread subspecies silvestris, in which case the Scottish wildcat is Felis silvestris silvestris. Arcane naming issues aside, the underlying point is this: extinction of Scottish wildcats does not mean the species goes extinct. It means that a certain subset of populations that make up the species goes extinct. As sad as seeing the last of the "highland tigers" (as Scottish wildcats are called locally) would be, their loss alone would not necessarily mean the whole species is in trouble. But scale up those losses to wiping out most of the populations in most parts of the world-as is the case, for example, for real tigers-and extinction of the entire species becomes a real threat. That is what makes the world sit up and take notice. The prelude to a species' extinction is that for whatever reasons, more individuals of that species die with each generation than are born. If that keeps up, the populations to which those individuals belong disappear-that is the stage the Scottish wildcats are at, and in fact, the disappearance of Scottish wildcats is the continuation of a trend that has already wiped out nearly all other wildcat populations in Great Britain, and most of them throughout Europe. The next stage in the extinction process is that deaths happen too fast to be replaced by new births throughout most of the populations in a species. That's where the loss of Lonesome George comes in. Pinta Island once had many populations of Galápagos tortoises in George's subspecies, but tortoise by tortoise, they faded out, until he was the last one standing. Technically, his subspecies survived until his death, but in reality, it was the walking dead, a zombie subspecies, long before Lonesome George actually died. Once a population or subspecies falls below a certain number of individuals, it can be virtually impossible to build back to viable numbers for the long run. In turn, the loss of a subspecies often reflects an overall decline in numbers of individuals throughout the entire species-as was certainly the case with the Galápagos tortoises, whose numbers began to fall precipitously after those long-ago sailors discovered them. In the 1500s, somewhere in the neighborhood of 250,000 tortoises were spread throughout the Galápagos Islands. By the 1970s, there were only 3,000 left, the result of people eating them, using and selling their fatty oils for fuel, converting their natural habitat to agriculture or other human constructs, and bringing in domestic livestock and pets that became ecological competitors or predators (particularly on tortoise eggs and baby tortoises). Even though all ten or so subspecies of Galápagos tortoises were still alive in the 1970s, the species was clearly in trouble, having declined by an average of a little over 400 tortoises a year for some 600 years. At that rate, those 3,000 individuals alive in 1970 would have dwindled to nothing in fewer than ten years if people hadn't stepped in to help. In that context, Galápagos tortoises became (and remain) "threatened with extinction" in a strictly defined scientific sense. What scientists who study extinction mean when they use those words is much more than a general statement that a species is in trouble. It's an expression of exactly how much trouble a species (or in some cases, a subspecies) is in, defined by stringent criteria that include things like how fast individuals and populations are dying off, how fast the habitat they need to survive is disappearing, and so on. The scientific body that has taken on the task of determining extinction risk is composed of thousands of biologists and is known as the International Union for the Conservation of Nature, or IUCN.Without going into detail here, suffice to say that the IUCN has come up with a set of rules for sorting species into categories according to their risk of extinction.7 Species are listed by category in the IUCN Red List of Threatened Species.Those of "least concern" are considered to be in pretty good shape. Subsequent categories move to progressively higher risk of full-on extinction: "near threatened," "vulnerable," "endangered," "critically endangered," "extinct in the wild" (meaning the only survivors are in zoos and such), and finally, when the last individual blinks out, "extinct." Species that fall in the three categories most at risk, short of being extinct in the wild-vulnerable, endangered, and critically endangered-are grouped under the IUCN label "threatened." This raises an important flag when you're reading about extinction. Like many scientists who write about these things, when I call a species "threatened," particularly in this book, I'm using the word in its IUCN context-it's shorthand for saying that a species falls in one of those three higher-to-highest risk categories. That, of course, is not always the case when you read a news article about extinction, in which "threatened" may be used in a much more general sense. Likewise, you have to be careful with the word "endangered," because it too is used in many different ways. For instance, saying a species is endangered under the United States Endangered Species Act is not quite the same as saying it's endangered in the sense of IUCN categories. The IUCN has its work cut out for it. Studying all the species in the world to determine which of the categories they fall into is a Herculean task-by latest estimates, there are some 8.7 million species in the world (and that doesn't count the vast majority of the microscopic ones). As of 2013, the IUCN had worked its way through about 70,000 species, at the rate of about 5,000 species each year over the preceding decade. It's not too hard to do the math and realize that even if we were to assess all of the species that scientists have named-which amounts to only about 1.3 million out of those 8.7 million estimated to exist-we'd be looking at another 246 years of work. So the IUCN has come up with two other categories to sort species into: "not evaluated" and "data deficient." Most species are in the "not evaluated" category-simply put, nobody has taken the time to look at them yet, so we don't know if they are in good shape, bad shape, or somewhere in between. "Data deficient" species are those for which we have some inkling of what's going on, but which haven't been studied enough for us to stick our necks out and place them in one of the other categories. Which brings up an important point about the way the scientists who categorize species in this way work: they tend to be cautious about saying something is so if there is not strong evidence to back up the conclusion. The problem with that methodical approach to sorting species into categories is that it sometimes puts a not-so-bad-sounding label on an on-the-ground situation that is really pretty terrible. Take "vulnerable," for instance, the category into which Lonesome George's species (Chelonoidis nigra) is placed. What doesn't really come through with that simple word is that by the 1970s, the number of animals that used to be normal for the species had been reduced by 99 percent. African elephants (Loxodonta africana) are also classified as "vulnerable" by the IUCN as of 2010 (the date of their most recent comprehensive evaluation). That listing takes into account that ivory poachers killed nearly half of Africa's elephants in the 1980s, before an international ban on ivory trade quelled the market. It does not take into account what has happened since 2009: as affluence has increased in China, the demand for ivory there has driven the price sky high, making ivory sales profitable enough for international crime rings to get into the act. As a result, the 50 percent of African elephants that managed to survive the 1980s onslaught is being decimated in record-high numbers. In Tanzania alone, 31,348 elephants fell under poachers' guns from 2009 to early 2012-that's 42 percent of Tanzania's entire herd.8 In the space of just a few weeks in early 2012, marauding horsemen killed and hacked off the tusks of over half of the four hundred elephants in Cameroon's Bouba N'Djida National Park.9 In Garamba National Park in the Democratic Republic of the Congo, twenty-two elephants-a whole extended family-were slaughtered in one fell swoop by gunfire that appears to have come from a Ugandan army helicopter. By the time rangers got there, a million dollars' worth of tusks had been hacked off and hauled away.10 That event, on top of the kills that preceded it, contributed to reducing the total number of elephants in Garamba to a tenth of the previous population, from around 20,000 to 2,400. The new twist is dumping cyanide into water holes at which elephants drink, a technique that killed eighty-one elephants in a single September day in 2013 in Hwange National Park, Zimbabwe.11 The net effect is the greatest percentage loss of elephants in history. More than a million elephants are thought to have roamed Africa prior to 1980; after the 1980s decimation there were perhaps 600,000 left; in the three years preceding 2012, that dropped down to about 450,000. Continuing the death rate that has marked the years 2009-2012 would mean there would be no more wild African elephants on Earth in twenty years. That's "vulnerable" to extinction indeed. Now, multiply that elephant story, or Lonesome George's story, by 10,519-that's how many species the IUCN has classified as vulnerable as of the time I write this.12 Even worse off, in terms of extinction risk, are those species in the endangered category-add another 6,169 species. Endangered species are those like the Atlantic bluefin tuna (Thunnus thunnus), which we love to eat and whose numbers and geographic extent have been reduced more than 50 percent in their last three generations (that is, over about three decades); the blue-capped hummingbird (Eupherusa cyanophrys), a stunningly beautiful iridescent green bird with bright purple wings that now is down to about 2,500 individuals restricted to a small area in southern Oaxaca, Mexico; and the growling grass frog (Litoria raniformis), whose numbers have fallen by more than half in the last decade, thanks mostly to a deadly fungus that is killing amphibians by the millions worldwide. Critically endangered species-numbering 4,226 as I write this-are even closer to the brink. Examples include western gorillas (Gorilla gorilla) and the bizarre-nosed chameleon (Calumma hafahafa) (a species that deserves keeping alive for its name alone). Gorillas have lost 80 percent of their individuals in just the last three generations (over the past sixty years); even in protected areas, 45 percent of them died in the twenty-year period from 1992 to 2011. Bizarre-nosed chameleons are known only from Madagascar, where a very few individuals have been found exclusively in small patches of habitat that probably total no more than a hundred square kilometers. That habitat is rapidly being taken over by slash-and-burn agriculture, logging, and cattle grazing. Rapid losses like these are rampant. The number of species we now know to be threatened with extinction (remember, that's the sum of all the vulnerable, endangered, and critically endangered species) is a whopping 20,614 species out of the approximately 70,000 species that have been assessed by IUCN standards. That list includes not only animals with backbones (that is, vertebrate animals), which I chose for all of my examples above, but also annelids (worms and relatives), arthropods (insects, spiders, and relatives), cnidarians (jellyfish and relatives), molluscs (clams and snails), nemertine marine worms, onycophorans (velvet worms), plants, and a very few protists.13 All of these species are now on the Lonesome George trajectory-their remaining individuals are the last ones standing after intense human impacts have severely depleted their numbers over the past few decades. Let's say, for the sake of argument, that all of these species continued down that Lonesome George path, eventually dimming into extinction. Just how abnormal would that be, given that Earth's species have waxed and waned over much longer courses of time than just a human lifetime or two? Here's a way to get a quick sense of how what's happening now compares to what's happened over the past five centuries or so. We know that about eight hundred species have died out in the last five hundred years. We also know that the vast majority of those species were driven to extinction by people-because we overhunted them, converted their habitat into something that we thought would serve us better in the short term, or introduced competing species intentionally or inadvertently. Those are, of course, the same threats that are driving species toward extinction today, although the magnitude of those threats has increased dramatically, and some new ones (like pollution and climate change) have been added. Continuing the present rates of decline means that all of those 20,614 currently threatened species will be extinct within the next five hundred years (many of them much, much sooner). That would be twenty-five times as much loss in the next five centuries as in the last five. Considering that even the past five hundred years-the years 1500-2000-had elevated extinction rates with respect to what's normal over the thousands and millions of years that make up geologic time (as I'll deal with in more detail in chapter 2), what appears to be coming down the pike in the next few centuries is truly out of the ordinary. So out of the ordinary, in fact, that sustaining current rates of extinction will guarantee that we bring on the so-called Sixth Mass Extinction. It's called that because there have been only five other times in the past 540 million years (that's right, million years) when extinction on Earth has been as intense and as rapid as it is today. Those are known among paleontologists as the Big Five Mass Extinctions. The most recent was about 66 million years ago, when the big dinosaurs were lost forever, and that was in fact one of the least severe. "Only" 76 percent of Earth's known species died out then. The worst mass extinction was about 252 million years ago, and it saw the deaths of more than 90 percent of known species. No wonder it's been called the Great Dying. That's why the thought of the Sixth Mass Extinction-where we're headed if we do nothing to save all the species presently at risk-is such a big deal. I'll elaborate on our progress toward the Sixth Mass Extinction in the next chapter, but for now, it's enough to say we really don't want to see it occur. We'd be looking at a world where more than three out of every four of the species we take for granted would be gone. That doesn't have to be. There are rays of hope. The last individuals standing as threatened species today don't have to be dead species walking, despite their high-risk status, because what the IUCN categories really reflect is not inevitable extinction, but "the likelihood of a species going extinct under prevailing circumstances" (italics mine).14 Those prevailing circumstances are the tremendous pressures humans put on other species through our sheer numbers and attendant needs and wants, which, as past experience shows and as business-as-usual would continue, leads to habitat destruction, overhunting and overfishing, introduction of competitors or predators that kill native species, pollution, climate change, and, importantly, the interactions among all those things, which act as multipliers of those threats. Predictions of doom all have one key assumption: that we will simply keep on doing things as we always have, without any regard for what we now know. That's kind of like being a train operator and seeing a school bus stalled on the tracks way off in the distance, knowing you can stop in time if you pull the brake lever hard now, but deciding what the heck, let's not bother. That would be an unusual scenario-humans are, in most cases, smarter than that. And in fact, we've shown we can be smarter than that when it comes to preventing extinction. Which returns us to Lonesome George and his species. Recall that in the 1970s, when Lonesome George was found, there were only 3,000 members of his species left, the nadir following the 99 percent loss that had begun centuries before. Now, more than 19,000 tortoises are doing their thing in the Galápagos. What reversed the almost-guaranteed extinction trajectory? In a word, people. Humanity saw the train wreck coming and decided to do something about it. The first step, of course, is acknowledging that the wreck is imminent. In the case of Galápagos tortoises, that was already evident by 1936, when the government of Ecuador listed the tortoises as a protected species. That acknowledged the problem, but tortoise numbers continued to dwindle, in part because the pressures on the tortoises had shifted from buccaneers eating them to settlers converting their habitat to farmland; there was also a decent market for selling the tortoises, their eggs, and their shells to dealers outside Ecuador. By 1959, Ecuador had addressed those problems in part by declaring all places uninhabited by people in the Galápagos a national park, and the Charles Darwin Foundation was created under the auspices of UNESCO and the World Conservation Union with the mission of preserving Galápagos ecosystems. The net effect was to elevate the national park to a global treasure and turn it into an economic engine for the locals and for Ecuador in general. Protection for tortoises and other species was strengthened at the same time: it became illegal to capture or remove any species from the islands. Nevertheless, the profit in tortoise trade did not go away, and tortoises and their eggs continued to be sold clandestinely, prompting Ecuador to pass another law in 1970 that made it illegal to export Galápagos tortoises or their eggs, regardless of whether the specimens were captured in the wild or bred in captivity. Finally, in 1975, the market was largely cut off when the tortoises were listed as an endangered species, not by the IUCN, but by the Convention on International Trade in Endangered Species of Wild Fauna and Flora, commonly abbreviated as CITES.15 That convention, by international agreement, places strict prohibitions on the import and trade of listed species-including by-products such as shell or bone-for all of the ratifying states, which now include about 179 out of the 196 nations in the world. All those legal measures slowed the killing of the last tortoises on the islands but couldn't change the fact that 99 percent of the species was gone. There was one more piece to the puzzle of how to save them, and that was to make sure more of their young survived under the conditions in which the tortoises now found themselves: a world where introduced animals like feral goats, dogs, and pigs ravenously ate tortoise eggs as well as baby tortoises. The way around that was for people to step in, collect the eggs prior to hatching, and take them to captive breeding colonies to rear the young past the age at which they were easy prey-it doesn't take too many years for the tortoise shells to get big enough and tough enough to provide the right kind of protection. Once that happened, the tortoises were (and are) returned to where the eggs were laid, and off they go on their own in their natural habitat. In concert with building the captive breeding program, the Galápagos National Park Service began to find and kill the introduced predators. As a result, the tortoises are coming back. The day I saw Lonesome George at the Charles Darwin Research Center in 2011, I also saw, in enclosures not too far from him, young tortoises of most of the Galápagos subspecies, sorted by age and island, that were being groomed as saviors of the species. That this process is working became pretty clear to me when I walked along a windy beach on Santa Cruz Island the next day, waves crashing, and found myself dodging tortoise nests, some of which retained the leathery remnants of hatched eggs at their edges. The increasing numbers mean that Lonesome George's species is scrambling back from near annihilation. The tortoises are not out of the woods yet, but they have climbed one IUCN category in the right direction, from being endangered in 1996 to being vulnerable in 2012. That kind of success makes it clear that just as we humans can put tens of thousands of species at risk of extinction, we also have the power to pull species back from the brink, using the right combination of human ingenuity, carrots, and sticks. Multiplying that one success story by 20,000 or so more species is a pretty tall order. But, as we'll see in the rest of this book, it is within humanity's grasp, and we have good reason to make all those new success stories a reality-they're all that stand between us and the Sixth Mass Extinction. Paleobiologist Anthony D. Barnosky weaves together evidence from the deep past and the present to alert us to the looming Sixth Mass Extinction and to offer a practical, hopeful plan for avoiding it. Writing from the front lines of extinction research, Barnosky tells the overarching story of geologic and evolutionary history and how it informs the way humans inhabit, exploit, and impact Earth today. 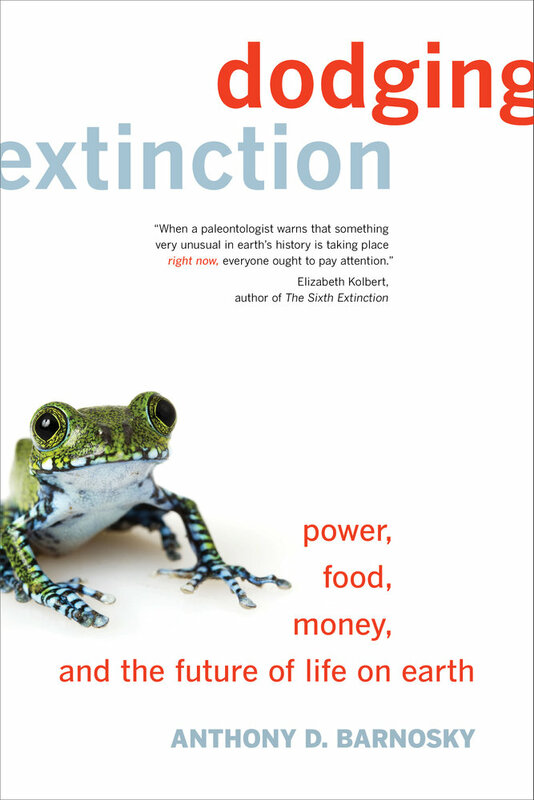 He presents compelling evidence that unless we rethink how we generate the power we use to run our global ecosystem, where we get our food, and how we make our money, we will trigger what would be the sixth great extinction on Earth, with dire consequences. Optimistic that we can change this ominous forecast if we act now, Barnosky provides clear-cut strategies to guide the planet away from global catastrophe. In many instances the necessary technology and know-how already exist and are being applied to crucial issues around human-caused climate change, feeding the world’s growing population, and exploiting natural resources. Deeply informed yet accessibly written, Dodging Extinction is nothing short of a guidebook for saving the planet. Anthony D. Barnosky is a Professor in the Department of Integrative Biology, Curator in the Museum of Paleontology, and Research Paleoecologist in the Museum of Vertebrate Zoology at the University of California, Berkeley. He is the author of Heatstroke: Nature in an Age of Global Warming (Island Press) and editor of Biodiversity Response to Climate Change in the Middle Pleistocene (UC Press).